As you know, I have been recommending all sorts of Korean products previously, even teaches tutorial on korean makeup tips. And I think the main key to look like a Korean, is to own a flawless smooth skin. This cosmetic brand has getting more popularity recently. I was so attracted by the latest Laneige advertisement by Song Hye Kyo. She is way too pretty at this age. I remember the first Korean Drama I watch was played by her. She was only 19 at that time. But till now, she still look the same!Everyone knows that Song Hye Kyo has a smooth and healthy skin. I don't think she need to waste lots of time in making up as she still look stunning without putting any make up on. I really wonder what is her beauty secret till I get to know that Laneige was her secret to stay young and flawless. 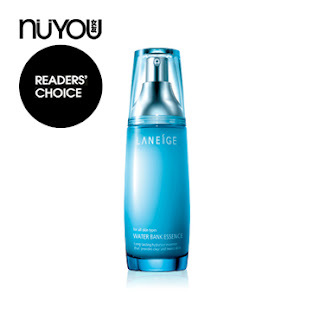 Laneige has been studying water science throughout the years to analyse the best water for individual's skin. Well, water is very important to keep our skin young and healthy. Keeping your skin hydrated is the best way to delay skin ageing process. Acne, pimples, whiteheads, blackheads, etc will all tend to occur when your skin is lack of hydration. That is why moisturising step is always so concerned in all skincare products. 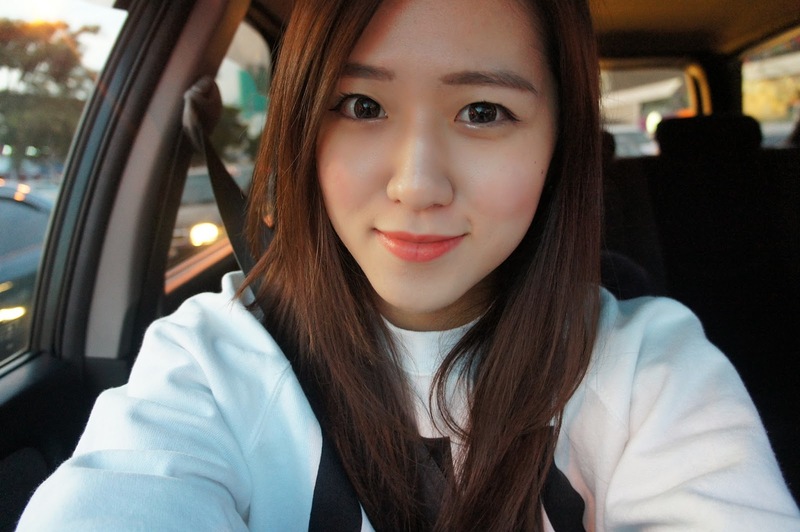 If you notice, Korean's beauty usually has a fair, flawless and brightening skin. Water is the main key make your skin smooth and refreshing. And this is the reason why people tend to choose Laneige products. One of my favourite Laneige skincare product is Water Bank Essence. I always have problem in moisturising my skin whereby most of the moisture essence hardly last for more than 12 hours. However, this essence has a powerful 24 hours long lasting moisture essence effect that contains mineral water for skin regeneration and Water Pump System for circulation. This is mainly to safeguard your skin moisture and to hold it in to allow the skin stay moisturised and smooth. 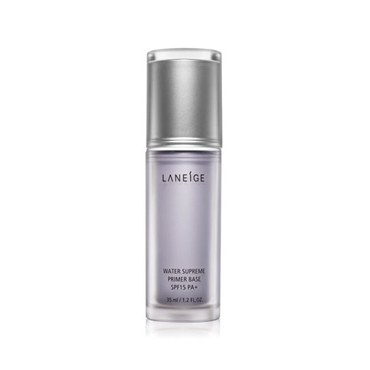 You can actually form a natural moisture barrier on skin surface by applying this essence after applying your emulsion. It instantly dampens your skin with ample moisture, to protect the moisture that is in the skin. Seaweed extracts and chestnut extracts in this product is also able to enhance keratin turnover to fight against roughness and energizes the skin to maintain a smooth and healthy texture. It is important to apply moisturiser after essence. 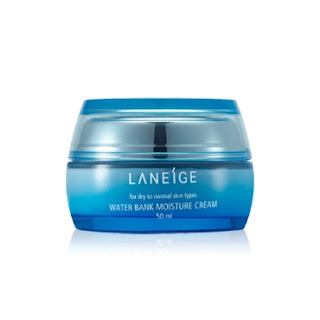 In order to create a strong hydrating effect, I will definitely choose Water Bank Moisture Cream to give my skin a richer texture with smooth and shiny skin. This cream is also 24 hours long lasting, so you do not need to worry that your face may tend to turn oily or dry after working the whole day. It contains special mineral water for skin regeneration. The Water Pump System is also included in this moisturising cream which is important in moisture circulation to safeguard skin moisture and hold it in to leave skin moisturised. Grape seed oil and mango seed oil are added as an antioxidant and also provides soothing properties to emulsify the skin and supply nutrition and energy. If you ask what would be my favourite make up product in Laneige, i will answer " It would definitely be Water Supreme Primer Base and Snow BB Soothing Cushion!" As you know, make up base has to be applied before foundation to provide a protective layer for skin before make up. Sometimes i find hard to apply my make up on when i have breakouts during exam. Especially when my face skin is extremely dry. Applying make up on is like making my skin to look worse and it even reveals the bad texture of my skin. Therefore, I think Water Supreme Primer Base is absolutely suitable to avoid and to come across this problem. The deep dimension water could smoothly refines the surface of skin and fills the skin with suppleness and plumpness of moisture coating. As such, it is able to give your skin a smoother texture that is free from pores and scary wrinkles! Optimal mineral water and 3D Hydra technology are invented to form a protective barrier on skin to hold in moisture and retains moisture all day long. I think this is the best part of Water Supreme Primer Base as it helps to hold up moisture on skin instead. Natural skin correction of skin will not alter the tone of your foundation but, it actually enhances your natural complexion. 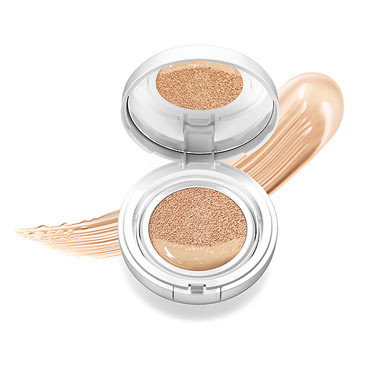 Oh ya, not to mention, it also has SPF 15 PA+ UV protection for your skin. Isn't it great? 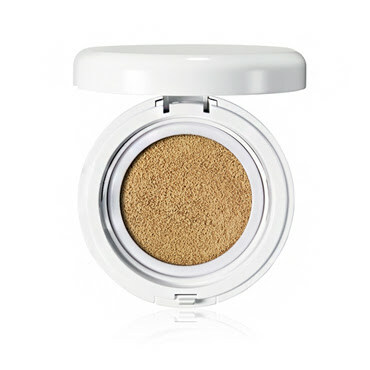 Snow BB Soothing Cushion is a new concept type of BB with five active ingredients included. The five ingredients include whitening, suncreen, sweat proof, soothing and make up effect! How cool was it ! It is compacted in a cushion form to maximize the refreshing and soothing sensation. When you touch it your puff, the air pump in the cushion creates air bubbles for thin, light and natural skin friendly makeup. It also provides two separate containers to preserve the active ingredients and their functionality. This is so much suitable for person like me that love convenient stuffs. You can just pat it on your face just to simply touch up your make up. Moreover it has 5 effects on it. 5 in 1, that is so awesome !Just a simply quick touch up to look flawless with BB Soothing Cushion. If I had a chance, I really wish to try out all Laneige beauty products!So far I haven't try out their products yet but I always heard good reviews from Laneige users. I love the water science concepts of Laneige as everyone knows that water gives beauty, and beauty gives self-confidence ! I hope I would stand this chance to join the workshop conducted by Laneige to know the tips and secrets to create K-Beauty!